August 7th was the 30th anniversary of the first Olympic baseball tournament gold-medal final, when it was a demonstration sport played at Dodger Stadium at the 1984 Los Angeles Games. In 1984, there were a lot of big names on that squad for the United States. Mark McGwire and 19 more college players made up what he later called a dream team — notables included Will Clark and Barry Larkin. Ken Caminiti was among the final cuts. Future Hall of Famer Barry Larkin was a bench warmer. And with McGwire playing first base, Will Clark was pressed into duty in the outfield. The 1984 Olympic team the greatest collection of U.S. amateur players up to that date. Eighteen of the 20 Olympians were drafted in MLB’s first round in 1984 or 1985. Japan shocked the U.S. for gold, 6-3, after losing six of their seven pre-Olympic exhibition meetings. Headed by Reiichi Matsunaga, 4 subsequent Olympic coaches and Katumi Hirosawa who hit 3-run homer at the final game told funny stories and experience how special it was to take part in the Olympic games. 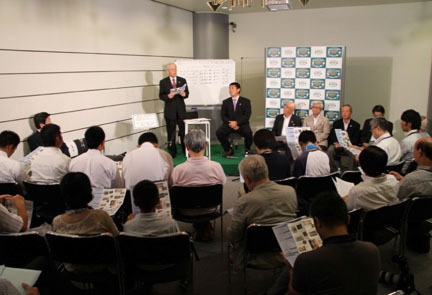 After the talk event, Yoshinobu Suzuki, Vice President of Baseball Federation of Japan, revealed that Seino Transportation, the winner of 2014 Intercity Baseball Tournament will travel to Paris to participate in the “Yoshida Challenge”, an International baseball event in honor of Yoshio Yoshida who serves as IBAF Ambassador of Olympic Reinstatement, from September 5 to 9, 2014 at the Templiers Senart facility just south of Paris. Suzuki commented that the trip will serve to promote the sport in Europe and the reinstatement drive by World Baseball Softball Confederation.